2. Key Laboratory of Laboratory Medical Diagnostics, Ministry of Education, Department of Laboratory Medicine, Chongqing Medical University, Chongqing, 400016, China. Background and Aims: Verteporfin (VP), clinically used in photodynamic therapy for neovascular macular degeneration, has recently been proven a suppressor of yes-associated protein (YAP) and has shown potential in anticancer treatment. However, its anti-human leukemia effects in NB4 cells remain unclear. In this study, we investigated the effects of VP on proliferation and apoptosis in human leukemia NB4 cells. Methods: NB4 cells were treated with VP for 24 h. The effects of VP on cell proliferation were determined using a Cell-Counting Kit-8 assay (CCK-8) assay and colony forming assay. Apoptosis and cell cycle were evaluated by flow cytometry (FCM). The protein levels were detected by western blot. Results: We found that VP inhibited the proliferation of NB4 cells in a concentration and time-dependent manner. FCM analysis showed that VP induced apoptosis in a concentration dependent manner and that VP treatment led to cell cycle arrest at G0/G1 phase. Moreover, VP significantly decreased the protein expression of YAP, p-YAP, Survivin, c-Myc, cyclinD1, p-ERK, and p-AKT. In addition, VP increased the protein expression of cleaved caspase3, cleaved PARP, Bax, and p-p38 MAPK. Conclusions: VP inhibited the proliferation and induced apoptosis in NB4 cells. Keywords: Verteporfin, NB4 cells, YAP, proliferation, apoptosis. Acute promyelocytic leukemia (APL) is a unique subtype of acute myeloid leukemia (AML) . Cytogenetically, APL is characterized by a chromosomal t(15;17) translocation, which results in production of the oncogenic PML/RARα fusion protein [2, 3]. Intensive studies of APL pathogenesis have resulted in several breakthroughs in the treatment of this disease. However, the classical treatment of APL, namely the use of the chemotherapeutic drugs all-trans retinoic acid (ATRA) and arsenic trioxide (ATO), is associated with recurrence in most patients. Furthermore, ATRA treatment results in leukocytosis and retinoic acid resistance in some cases [4-9]. Therefore, the development of novel therapeutic agents for more effective treatment of patients with APL is necessary. VP was granted FDA approval in 2000 [10, 11]. Since then, the potential of VP for the treatment of cancers, such as prostatic cancer and breast cancer, has been investigated . In recent years, VP has been reported to exhibit broad biological properties independent of light stimulation. For example, tumor-selective proteotoxicity of VP, which is linked to its ability to oligomerize proteins , was demonstrated in colorectal cancer . The Hippo/YAP pathway is a recently discovered signaling pathway involving a kinase cascade that regulates proliferation and apoptosis to control organ size during developmental growth, thus playing an important role in multiple signaling processes [15-18]. YAP is a key component of the Hippo pathway, and mutation or abnormal expression of YAP is associated with human tumorigenesis . The anti-tumor capacity of VP may be associated with its role in blockade of the canonical Hippo/YAP pathway, as previously demonstrated in other types of cancer [20-22]. Moreover, light-independent anti-leukemic activity of VP for Ph-positive acute lymphoblastic leukemia has been demonstrated . However, studies of the effect of VP on APL are rare. In the present work, we used NB4 cells, an APL cell line, to examine the effects of VP on cell biological properties. We found that VP affected NB4 cells proliferation and apoptosis. Our observations suggest that VP represents a novel therapeutic approach for APL. VP was purchased from Sigma (St Louis, MO). Antibody against PML/RARα was purchased from Abcam (China). Antibodies against MST1, LATS1, YAP, p-YAP (S127), p38 MAPK, ERK, p-ERK (Thr202/Tyr204), AKT, p-AKT (S473), p-S6 (S235/236), c-Myc and caspase3 were from Cell Signaling Technology (USA), Antibodies against PARP, Survivin, Bcl-2, Bax, connective tissue growth factor (CTGF) and cyclinD1 were from Wanleibio (China). The antibody against p-p38 MAPK (Thr180/Tyr182) was purchased from Millipore (USA). Goat anti-rabbit antibody, goat anti-mouse antibody and antibody against β-Actin were purchased from Zhongshan Goldenbrige Biotechnology Co., Ltd (China). Human leukemia NB4 cells were purchased from the Shanghai Institute for Biological Science and Human leukemia HL-60 cells (Fig. S2) were saved by our own laboratory. And cells maintained in RPMI-1640 supplemented containing 10% fetal bovine serum in an environment with 5% CO2 at 37°C. The NB4 cells were plated into 6-well plates, and then incubated with DMSO vehicle and VP (10 μM and 20 μM) for 24 h. Cell apoptosis was tested by Hoechst 33342 staining (Apoptosis-Hoechst staining kit; Beyotime Biotechnology, Haimen). Briefly, the cells from different groups were collected, and then cells were immersed in 0.5 mL of methanol for 10 min, followed by rinsing triple with phosphate-buffered saline (PBS). Then cells were stained with 1 μg/mL Hoechst 33342 compounds in darkness at room temperature for 5 min and washed triple with PBS again. Cells were analyzed by fluorescence microscopy. The apoptotic cells are seen as pyknotic and have fragmented nuclei emitting intense fluorescence. Cell proliferation was detected by CCK-8 kit (7Sea Cell Counting Kit; Sevenseas Futai Biotechnology Co., Ltd., Shanghai, China). NB4 cells in each group were seeded in 96-well plates at a density of 8.0×103 cells/well, and then cells were incubated with various concentrations of VP for 24 h. And then 10 μL of CCK-8 was added to each well followed by incubation for 2 h at 37°C. The absorbance at 450 nm was measured using an Eon spectrophotometer (Bio-Rad Laboratories, Inc.) and plotted to obtain cell growth curves. The experiment was repeated at least three times. Cells were washed using PBS. And the cell pellets were resuspended and stained with annexin V-FITC and propidium iodide (PI) (Sigma-Aldrich). The rate of cell apoptosis was analyzed using a FACsorter (BD Biosciences, San Jose, CA, USA) after incubating 15 min at room temperature. For cell cycle detection, cells were fixed with precooled 70% ethanol overnight at -20°C. After centrifugation, the cells were resuspended with RNase solution in a 37°C water bath for 30 min. Then propidium iodide staining solution was added and incubated for 30 min in the dark at room temperature. The cell cycle distribution was determined using a FACsorter. NB4 cells were pretreated with VP or DMSO vehicle for 24 h. Next, 3x102 cells were collected and plated in 24-well plates in methylcellulose medium in quadruplicate. The numbers of colonies were counted after incubation for 14 days at 37°C containing 5% CO2, and then the surviving colonies (a colony was defined as ≥ 50 cells) were counted. VP incubation cells keep in absolute darkness, and ambient light is present when cells lysis and total protein electrophoresis. Cells in each group were harvested and lysed by RIPA lysis buffer supplemented with proteinase and phosphatase inhibitors (Cell Signal, USA) at 4°C for 30 min. After centrifuged in 4°C for 15 min at 13,000 xg, the supernatants were collected. Next, Protein concentration was determined with BCA method. Then equal amounts of extracts (50 μg) were added in 10% SDS-PAGE and transferred onto the PVDF membranes (Millipore, Boston, MA, USA), and was locked in 5% non-fat milk, incubated with indicated antibodies at 4°C for 16-18 h, followed by incubation with HRP-conjugated secondary antibody for 1 h at room temperature. Detection was performed using the enhanced chemiluminescence substrate (ECL) (Millipore, USA). Signals were visualized and analyzed by the Bio-Rad Gel Imaging System on cool image workstation II (Viagene, USA). Statistical analyses were performed using SPSS 17.0 software (SPSS Inc., Chicago, IL, USA). Experimental results are presented as the mean ± standard deviation. An independent samples t-test was used to compare the results of two groups. Statistical analysis of western blot results was performed using analysis of variance (ANOVA). P<0.05 was considered a statistically significant. Each experiment was repeated at least three times. To test whether VP affects the viability of NB4 cells without light activation, we evaluated the viability of NB4 cells by CCK-8 assay. Treatment with different concentrations (DMSO, 2.5, 5, 10, 20 μM) of VP for 24 h, we observed that VP could inhibit proliferation (Fig. S1). Based on our CCK-8 assay observations, we used 10 and 20 μM concentrations for subsequent experiments. Next, NB4 cells were treated with different concentrations of VP for 0, 1, 2, 3 days respectively. The results indicated that VP inhibits the cell viability in a dose- and time-dependent manner (Fig. 1A-B). Meanwhile, the effect of VP on cell proliferation was also assessed by plate colony forming experiment. The results showed that VP significantly inhibited the colony forming capacity compared with DMSO vehicle treatment (P<0.05) (Fig. 1C). Cell cycle profiles of NB4 cells were determined by FCM. The results showed that VP induced cell cycle arrest at G0/G1 phase from 28.52%-72.20%, compared with DMSO vehicle group (Fig. 1D). Next, the expression levels of several cell cycle-related proteins were measured by western blot. The results showed that VP treatment decreased the protein expression levels of cyclinD1 and c-Myc (Fig. 1F-H). So these data indicated that VP inhibits proliferation by promoting cell cycle arrest at G0/G1 phase. We next determined whether VP induced apoptosis in NB4 cells. NB4 cells were treated with 10 μM and 20 μM VP for 24 h, treated with DMSO as control group. We evaluated the intensity of apoptosis by FCM. The results showed that VP caused drastic cell apoptosis of NB4 cells in a concentration dependent fashion. And cells apoptosis rate was significantly increased in the VP-treated groups relative to control group (Fig. 2A-B). To exhibited apoptosis characteristic morphological changes, we stained the different group cells with Hoechst 33342 staining kit. The results showed significant differences after treatment with VP compared with DMSO vehicle treatment. The Hoechst 33342 staining indicated the cell nucleus fragmentation (Fig. 2C). Moreover, western blot analysis examined the protein expression levels of the apoptosis regulatory proteins: PARP, caspase3, Bax, and Bcl-2 (Fig. 2D-J). Consistently, cleaved PARP, cleaved caspase3, and Bax increased in VP treatment groups compared with DMSO vehicle group. Meanwhile, Bcl-2 decreased in NB4 cells exposed to VP treatment. So these data provided strong evidence that VP induces NB4 cells apoptosis. 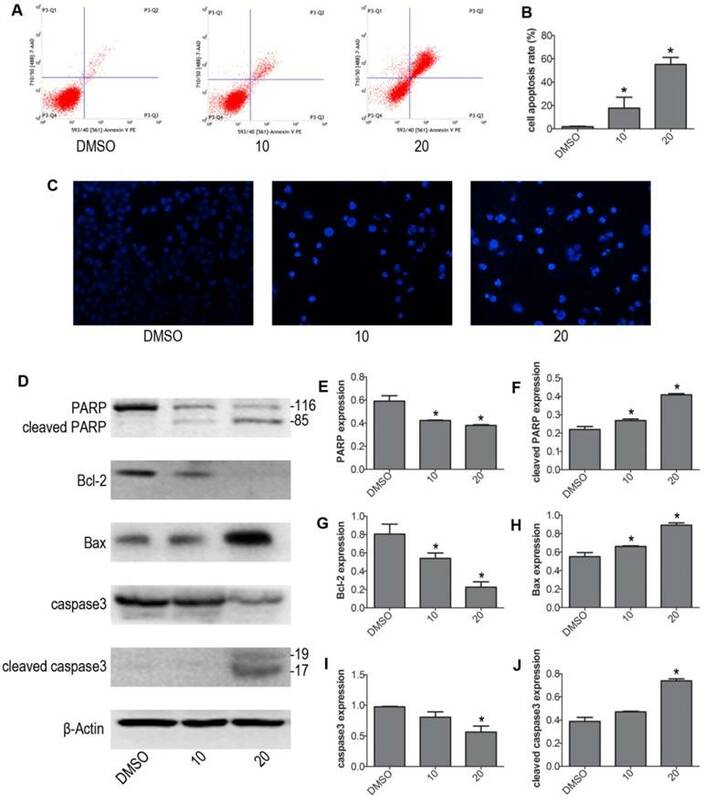 To further explore the mechanism of VP-induced apoptosis, the protein expression levels of Hippo pathway signaling molecules were determined by western blot. The results showed that VP not only inhibited YAP downstream molecules (CTGF and Survivin), but also decreased the protein expression levels of YAP upstream signal molecules: MST1 and LATS1 (Fig. 3). These data implied that VP induced cell apoptosis maybe through affecting Hippo/YAP pathway in human leukemia NB4 cells. To further investigate the molecular mechanism of VP induced cell apoptosis in NB4 cells, we tested the protein expression levels of p-ERK, p-p38 MAPK and p-AKT by western blot. VP treatment increased the protein expression level of p-p38, and decreased the protein expression levels of p-AKT, p-S6 and p-ERK (Fig. 4). The results illustrated that VP-induced cell apoptosis may be associated with AKT/MAPK signal pathway. The PML/RARα is a leukemic gene. Generally believed, the PML/RARα complex is currently regarded as an essential factor for terrible morbidity and reputed as an important marker for APL diagnosis . 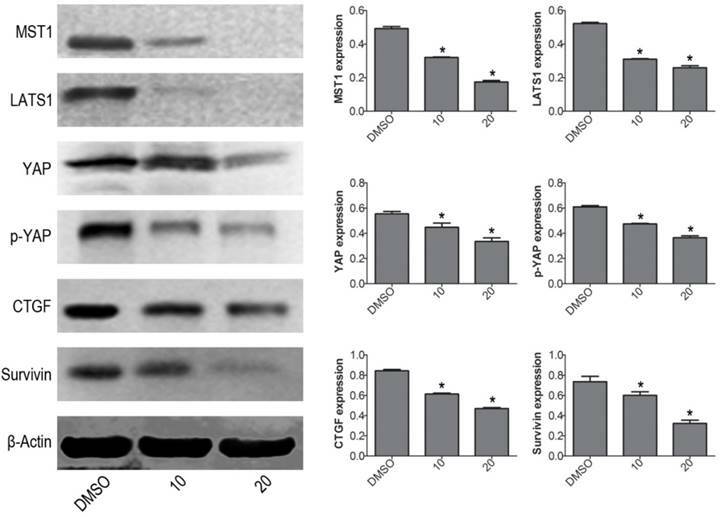 With western blotting, the protein expression level of PML/RARα fusion protein was obviously decreased when treated with VP for 24 h on NB4 cells, compared with DMSO vehicle group (Fig. 5). The difference was significant (P<0.05). APL is a distinct type of tumor that accounts for approximately 10% of all AML cases. ATRA and ATO chemotherapy drugs constitute the current primary treatment strategies for APL. Although the rate of complete remission of APL is over 90%, 10-30% of patients with APL are not sensitive to ATRA and ATO . Furthermore, the development of mutations in PML and RARα, resulting in resistance to ATRA and ATO, is common [9, 26]. Therefore, development of new and effective strategies for treatment of APL is crucial. The present results indicate that VP has potential for treatment of human tumors. However, among the numerous studies on the potential utility of VP for cancer treatment, few have focused on APL. In our study, VP exhibited promising therapeutic effects in human leukemia NB4 cells. VP inhibited the proliferation of NB4 cells. (A-B) Cell viability was detected by CCK-8 assay. (C) The in vitro colony-forming ability of NB4 cells was tested. (D-E) Cells cycle distribution was tested by FCM. (F-H) Effects of VP on protein expression levels of c-Myc and cyclinD1 were determined by western blot. Quantitative analysis was performed by measuring the relative expression levels of c-Myc and cyclinD1 to that of β-Actin. Data are expressed as means ± SD. *P < 0.05. VP induced apoptosis of NB4 cells. (A-B) Cells were treated with VP for 24 h, and apoptosis was analyzed by FCM. (C) Apoptotic cells were observed by Hoechst 33342 staining (Magnifications 20x). (D-J) The effects of VP on the protein expression levels of PARP, cleaved PARP, Bcl-2, Bax, caspase3, and cleaved caspase3 were determined by western blot. Quantitative analysis was performed by measuring the relative proteins expression level to that of β-Actin. Data are expressed as means ± SD. *P < 0.05. The proliferation and apoptosis of leukemia cells treated with VP were tested in vitro. The present CCK-8 assay results showed that the proliferation of NB4 cells was inhibited by VP in a concentration and time-dependent manner (Fig. 1A-B), which was further confirmed by the colony formation assay (Fig. 1C). These results suggest that VP suppresses NB4 cell proliferation. Interestingly, VP has been reported to inhibit cell proliferation and to induce G0/G1 arrest in pancreatic ductal adenocarcinoma cells, hepatocellular carcinoma cells, human retinoblastoma cells, uveal melanoma cells, and chronic granulocyte leukemia cells [20, 22, 27-29]. Similarly, our FCM data also indicate that cell cycle arrest at the G0/G1 phase is induced by VP treatment. Additionally, the cycle-related protein expression was assessed by western blot (Fig. 1F-H). cyclinD1, which is closely involved in the proliferation of cancer cells, plays an important role in the G1/S phase transition, which may facilitate the occurrence of tumors . In this study, we found that VP treatment remarkably decreased the protein expression of c-Myc and cyclinD1, which may subsequently arrest the cell cycle at the G0/G1 phase. Therefore, our data imply that VP inhibits proliferation of NB4 cells by inducing G0/G1 phase cell cycle arrest. VP affects Hippo/YAP signaling pathway in NB4 cells. Western blot analysis was used to measure the protein expression levels of MST1, LATS1, YAP, p-YAP, CTGF, and Survivin. Quantitative analysis was performed by measuring the relative proteins expression level to that of β-Actin. Data are expressed as means ± SD. *P < 0.05. Furthermore, our results indicate that VP promotes apoptosis of NB4 cells, as shown by FCM (Fig. 2A-B). The apoptosis associated protein expression levels of Bcl-2, Bax, cleaved PARP, and cleaved caspase3 showed meaningful changes with VP treatment. The data indicate that VP induced apoptosis in NB4 cells. Our preliminary unpublished results have also shown that VP promotes apoptosis of HL-60 cells (Fig. S2). However, the present study focused on the NB4 cell line. To investigate the mechanisms, we tested multiple signaling molecules by western blot. The results indicated that Hippo/YAP and AKT/MAPK pathways are involved. 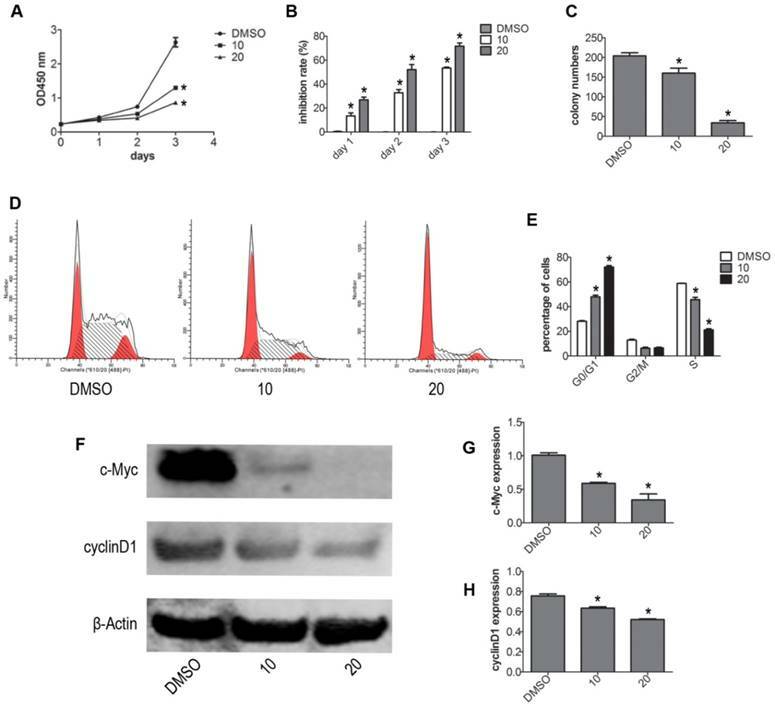 Dysregulation of the Hippo pathway is involved in numerous cellular processes associated with cancer progression, such as increased cancer cell proliferation, inhibition of apoptosis, and dysregulated cellular differentiation . Furthermore, our data show that VP decreased the protein expression of YAP and p-YAP. Interestingly, the protein expression of signaling molecules upstream of YAP, namely MST1 and LATS1, decreased in the VP-treated cells compared with that in the DMSO vehicle-treated cells (Fig. 3). Additionally, the downstream targets of YAP, CTGF, and Survivin were down-regulated in cells exposed to VP. These results indicate that the induction of apoptosis by VP is associated with the Hippo/YAP pathway. Recently, it was shown that YAP mediates crosstalk between the Hippo and AKT/MAPK pathway . To further investigate the mechanism underlying VP-induced apoptosis, we tested the expression of proteins associated with the AKT/MAPK pathway. The phosphatidylinositol 3-kinase (PI3K)/AKT signaling pathway plays a central role in the regulation of tumor cell proliferation, transcription, apoptosis, cell migration, survival, and angiogenesis . Previous studies have confirmed abnormal activation of the AKT signaling pathway in both acute leukemia and chronic leukemia . The present data show that p-AKT and p-S6 levels decreased following VP treatment compared with those in cells treated with the DMSO vehicle (Fig. 4). These results indicate that the AKT pathway is involved in VP-induced apoptosis in NB4 cells. Furthermore, we tested the protein expression of the MAPK pathway-associated molecules ERK and p38 MAPK. The MAPK pathway is directly linked to the apoptotic potential and growth of cells . Our study demonstrated that the level of phosphorylated ERK decreased after VP treatment, which suggests that VP inhibits MEK/ERK signaling in APL cells. Several reports have indicated that blast cells from AML, including APL, exhibit constitutive activation of ERK . Furthermore, it was reported that inhibition of MEK activation reduced PML/RARα expression in both NB4 cells and primary APL blast cells . These findings indicate that MEK/ERK signaling may be important for VP-induced cytotoxicity and apoptosis. It was further reported that p38 MAPK regulates cell apoptosis, proliferation, and senescence , and that p-p38 MAPK is expressed at lower levels in AML cells than in normal hematopoietic stem cells . In our study, VP increased the expression of p-p38 MAPK, which suggests that the observed apoptotic changes are dependent on p38 MAPK signaling. 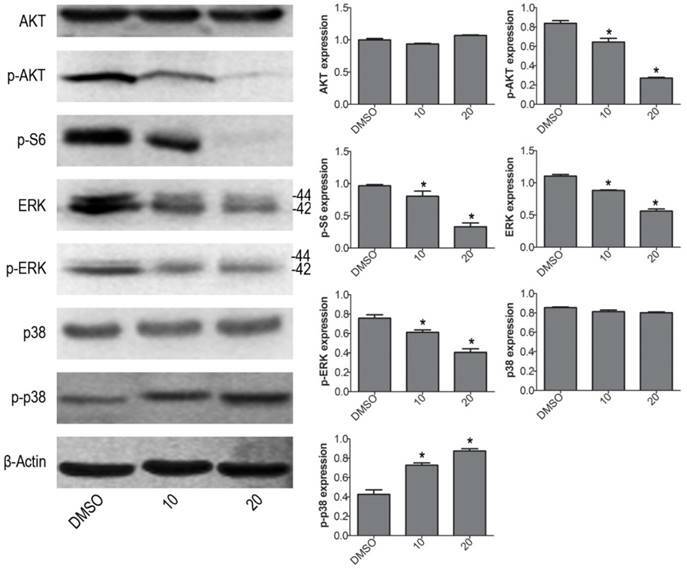 VP affects the protein expression levels of AKT/MAPK signaling molecules in NB4 cells. Western blot analysis was used to measure the expression levels of AKT, p-AKT, p-S6, ERK, p-ERK, p38 MAPK and p-p38 MAPK. Quantitative analysis was performed by measuring the relative proteins expression level to that of β-Actin. Data are expressed as means ± SD. *P < 0.05. VP down-regulates PML/RARα fusion protein expression in NB4 cells. Western blot analysis was used to measure the protein expression level of PML/RARα (120KD) oncoprotein. Quantitative analysis was performed by measuring the relative expression level of PML/RARα fusion protein to that of β-Actin. Data are expressed as means ± SD. *P < 0.05. Furthermore, we evaluated the expression of the fusion protein PML/RARα in NB4 cells. Our results showed that VP significantly decreased the expression of the PML/RARα fusion protein in NB4 cells (Fig. 5), suggesting that VP-mediated inhibition of proliferation and induction of apoptosis in NB4 cells is associated with PML/RARα. In fact, the exact mechanism by which VP induces apoptosis remains to be further explored. Recently, Zhang et al. suggested that VP increases apoptosis by inducing the formation of high molecular weight complexes (HMWC). However, Konstantinou et al. suggested that light during cell lysis and electrophoresis might lead to an artifactual decrease in protein expression resulting from HMWC formation . Our western blot assay did not eliminate ambient light especially at the cells lysis step. Therefore, we have included some key full-length western blots to supplement our data (Figure S3). In our results, the protein expression of YAP and PML/RARα shows the HMWC phenomenon, but absent of other protein expression in the full-length western blots. The reasons may be that the YAP and PML/RARα domains are directly involved in the formation of HMWC, or they help indirectly by bringing the molecules into close proximity, or the intracellular YAP and PML/RARα proteins are being modified. Other possible reasons for the reduced protein levels unrelated to the effects of VP itself may exist, such as environmental light during cell lysis, the adsorption of various intracellular proteins by VP, and specific characteristics of the NB4 cells. The relationship between the VP-induced decrease in protein expression and HMWC formation remains to be explored. In our study, we mainly studied the effects of VP in human leukemia NB4 cells. Based on our results, VP induces apoptosis in NB4 cells. However, further study is required before clinical implementation of VP in leukemia treatment. In summary, the present results suggest that treatment with VP effectively reduces proliferation and inhibits the growth of human leukemia NB4 cells, without light activation, by inducing apoptosis and cell cycle arrest. The observed increase in p-p38 MAPK and decrease in p-ERK, p-AKT, and p-YAP levels suggest that the AKT/MAPK and Hippo/YAP pathways are involved in the pathogenesis of APL, via their effects on proliferation and apoptosis. Therefore, the present study provides novel insights into the potential utility of VP in the treatment of APL. Further investigation is necessary for the development of novel therapeutic VP-based approaches for leukemia. Our study was supported by the National Natural Science Foundation of China (No. 81171658) and the Natural Science Foundation Project of CQ CSTC (grant No. 2011BA5037).